This Easy Lemon Cake with Cream Cheese Frosting starts with a boxed lemon cake mix and a few extras that results in a dense, moist and super lemony cake. Topped with sweet and tangy cream cheese frosting a sweet yellow sprinkles. I’m going to admit upfront here that I’m just not that into cake. I mean, if it’s somebody’s birthday I’ll oblige and eat a piece but it’s not really a dessert I would often choose. Except when it comes to a lemon cake. I’ll always say yes please to that. Although I’m a lemon all year kind of person, I especially love it at springtime. The bright, citrusy flavor is just so lovely after all the warm, hearty foods of winter. This cake starts out with a boxed cake mix. If you aren’t a shortcut kind of person, I totally get it but you’re going to want to give this cake a try anyway. The base is lemon cake mix but then it’s jazzed up with more lemony ingredients to make it super flavorful, light and springy. I promise you won’t even be able to tell it started with a cake mix. Besides the lemon cake mix you will need a small package of instant lemon pudding mix (just the powdered mix, you won’t need to actually make the pudding), lemon Greek yogurt, eggs, milk and oil. 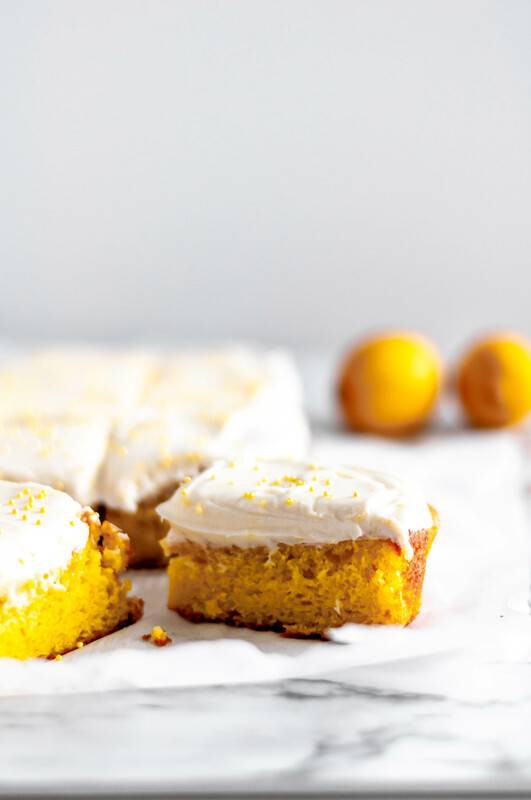 It’s also topped with a creamy, tangy cream cheese frosting that’s just as simple too with a touch of lemon running throughout it. The frosting consists of butter, cream cheese, vanilla, powdered sugar, a little salt and the zest of one lemon. Bonus: it takes just a few minutes to whip up in a stand mixer. My plan for this cake was to keep it simple so I baked it up in a 13×9 pan (this is my all time favorite one). I’m seeing this lemon cake at potlucks, picnics and barbecues all spring and summer long. You could definitely split the batter into two 9-inch round cake pans if you wanted to make a fancier layer cake. And if we’re going all out, make this lemon curd for the filling between the two layers. I’m here to help my friends. If you’re digging this doctored up cake mix, you need to check out this crazy chocolate overload cake. It’ll blow your chocolate loving mind. This Easy Lemon Cake with Cream Cheese Frosting starts with a boxed cake mix and a few extras to make a moist, dense, extra lemony cake that is a snap to mix up. Top it with this thick, tangy cream cheese frosting for the perfect welcome to spring. Preheat oven to 350 degrees F. Grease a 13x9 pan and set aside. In a large bowl, combine the cake mix and the pudding mix (just the powder mixes). In another bowl whisk together yogurt, oil, milk and eggs. Add to the dry ingredients and fold together until just combined. Bake for 35 to 40 minutes. Allow to cool completely. For the frosting: in a stand mixer cream together the butter and cream cheese. Once smooth, add vanilla and mix again. Add powdered sugar 1 cup at a time, being careful as you incorporate it into the butter/cream cheese mixture. Once all the sugar is incorporated, beat for 2 minutes on medium speed. Stir in salt and lemon zest. Spread over the cooled cake. Keep cake refrigerated.